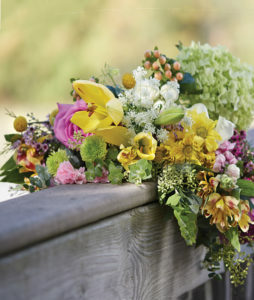 Take a look at our Mother’s Day gift guide to find the perfect flowers for mom. Mother’s Day celebrates all different types of mothers so it makes sense that there is not just one single present that is perfect for every mom. From your own mother to a friend who may have recently become a new mom, each mother is multi-faceted with individual interests. Like each flower is different with its individual beauty, each mom in our lives is extraordinary for just being the type of mother they are. In honor of all the different mothers in our lives, we are thrilled to put together a Mother’s Day Flower Gift Guide! We hope our unique gifts for mom inspire some great ideas to give any mothers in your life a remarkable gift to remember on their special day. A popular gift in recent years are subscription boxes that are mailed to the recipient’s home. This is a good gift for moms in faraway places or simply to surprise a mother with a gift on her doorstep. Our Year of Flowers gift programs are a fitting Mother’s Day gift that keeps reminding the mom in your life just how special she is. For the mother who loves watching a garden grow for freshly picked blooms, our Grower’s Choice Subscription is a wonderful choice. Our growers take the most striking selection of the day and create unique bouquets that feel rustic and farm fresh. 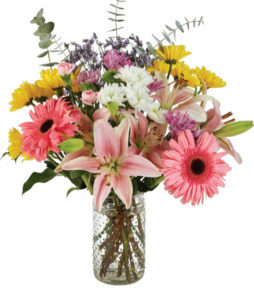 No two bouquets are alike so you can be sure mom receives something special all year long. 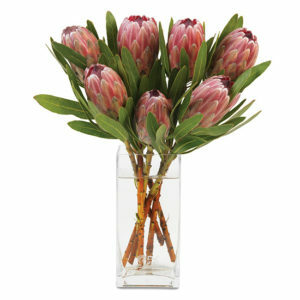 Our Pink Protea bouquet is pretty perfect for mamas who love interesting and new blooms. Growing up, this mother always loved celebrating the season’s finest whether it be for the holidays or using the changing seasons as an excuse to pull out celebratory home décor. If seasonal wreaths on the front door, cheerful trinkets on the mantle, and celebrating every holiday, no matter how obscure, was a fun part of growing up, something seasonal and whimsical would make a great gift for Mother’s Day. A year of Seasonal Designs would not only help ring in each season with something fun and festive, it would also provide her with plenty of home décor accents to keep every season feeling new and fresh. Do you remember your mother tending to houseplants or being able to name different types of plants on walks? Or perhaps you have a mom friend looking for a new hobby this spring. In this case, potted plants for Mother’s Day are a great gift that mothers can enjoy all year. Our Gardenia Bonsai has been lovingly and carefully pruned by our growers for something truly exceptional. This special bonsai has the pretty addition of scented gardenia blossoms that will bloom seasonally to serve as a sweet reminder of the love and memories of being a mother. 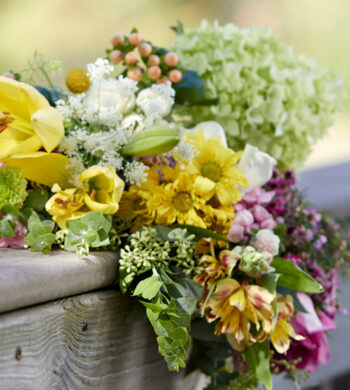 For a mom who knows exactly what is coming up next on the fashion front or enjoys learning the newest fads, we have a few twists on classic Mother’s Day flowers. From what we’ve seen this year, tropical flowers like bromeliads have been incredibly popular with their bright colors and interesting blooms. One such tropical that is turning heads this season is the protea flower. Available in the spring and summer, protea flower arrangements are incredibly unique with their eye-catching pineapple shape. Our Pink Protea Bouquet is a warm and meaningful gift for moms looking for something a little different this Mother’s Day. Proteas are also quite hardy which makes them a great choice if you are traveling or bringing a Mother’s Day bouquet to an event such as a brunch or tea party. For something classic, our Mother’s Day Masterpiece bouquet is a wonderful choice. For the mother who loves traditions, our take on the classic may be the perfect pick. 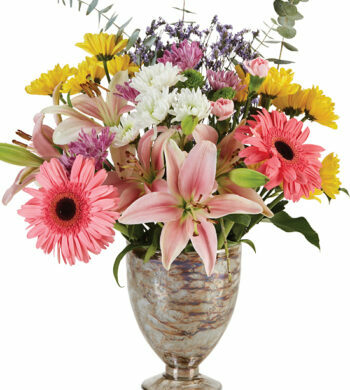 Our Mother’s Day Masterpiece Bouquet takes after the traditional bouquet with flowers that moms typically love like happy Gerber daisies, elegant lilies, and pretty eucalyptus accents. We also provide the choice between a marbled ceramic pedestal vase or our signature glass vase so you can make sure mom gets exactly what she wants on her day. If you’re still looking for that special something, make sure to browse our entire Mother’s Day collection to find exactly what the mother in your life will surely love.